The fledgling TTB Family Group met for the first time on Saturday 26th November 2011 for a gardening lunch at the Transition centre at Robsart Street. 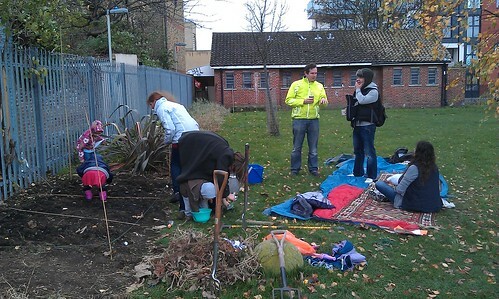 We planted broad beans to spell TTB (see photos), ate lunch together and shared thoughts about the future of this group. TTB Family Group: What should it be-do? (be-do, be-do, be-do)! Community family outreach, eg. Real nappies and breastfeeding peer support. Help promote sustainable ways of raising children eg. Extended breastfeeding network and elimination communication. 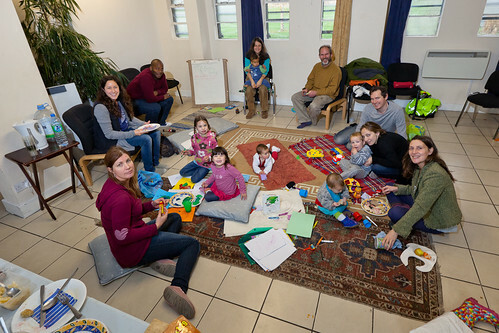 A growing unschooling community in SE London â€“ how can TTB help its local one? For photos of the day visit the TTB flickr site. We have booked 3rd Saturdays of the month at Robsart Street for the foreseeable future. BUT next gathering Saturday February 4th 2012, 11-2. If you would like to be on the group mailing list or want to comment in any way email us. Here is a photograph of the Centre looking particularly friendly and full of happy, well-fed, dirty-fingernailed, family gardeners. Thanks to Jamie for the picture.